When all was said and done, it was Alexander, Jarvis and Daniels in the top three. After the race, there were two questions that begged to be asked. The first one was with all of his wins this year, can Alexander even keep them all straight? The New Hampshire driver is quick to point out that he sure enjoys all of the winning moments. 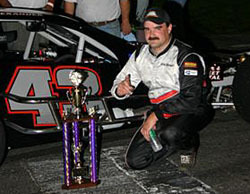 Kirk Alexander won another True Value Modified Racing Series event this past weekend. His latest victory came at Star Speedway. That’s not really a surprise. Alexander has won nine of the tour’s 13 events in 2005. But the win did not come very easy for him this time out. 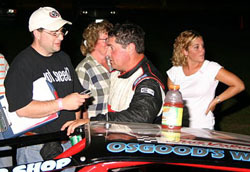 Visiting NASCAR Whelen Modified driver Jim Storace was the early leader at Star and he gave Alexander a run for his money in the middle stages of the race. Alexander tried several different approaches when it came to taking the lead from Storace. First, Alexander tried to stay on his rear bumper, hoping for the tiniest of slip-ups. That didn’t happen. Next, Alexander tired the outside groove. He got along Storace’s door but couldn’t complete the pass. After about a dozen laps of trying, Alexander tucked in again behind Storace’s bumper again. The fact that Daniels was even up in the top three late in the race was impressive. Between lap 75 and 100, the boxscore will show that Alexander led every lap and went on to the race win. Once again, it didn’t come as easy as it might have appeared. Late in the race, the cars of Dwight Jarvis and Peter Daniels weren’t very far behind. 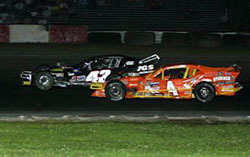 And either car might have had a shot at the victory had it not been for a late race caution that left the track soiled. Then, Alexander tried to nose under Storace’s car. But without an open lane, that wasn’t going to work. Finally, with 25 laps to go, Alexander was able to just motor on by using the outside groove. Instead, Jarvis was forced to try and hold off a charging Daniels. 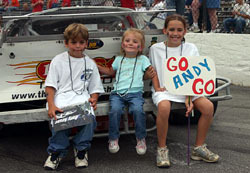 As Andy Seuss visited his hometrack, he had a few fans showing their support. Alexander in victory lane - again. The other question is can Alexander be beat and what needs to be done to do that? The True Value Modified Racing Series returns to action this Saturday at Seekonk Speedway. It will be their second points race of 2005 at the track and guess who won their previous stop there? If you picked Alexander, you are right. Then again, with a batting average of .692, you didn’t have to go very far out on a limb to guess that correct answer. Speed51.com's Miek Twist interviewes Dwight Jarvis after the race.